Siphiwo Ntshebe was born in 1974 in Port Elizabeth, South Africa, known today as Nelson Mandela Bay. His earliest musical experience was the classical music and opera that he heard when his mother was carrying him. From the age of 5 years Siphiwo sat on his father’s knee and would sing to the guests visiting his parent’s home. Later Siphiwo was greatly influenced by his grandfather who was a Reverend in the church in the Eastern Cape. As he grew up Siphiwo would perform in the small operas and musical plays that his father wrote for the local church. In spite of a clear gift in music Siphiwo was not offered the opportunity to develop his musical talent until his early teenage years. At that time he started to sing in the school choirs and also studied acting and drama. At the age of 16 Siphiwo had his first Italian Grand operatic experience performing with an orchestra in Port Elizabeth. His talent was spotted and he was offered a scholarship on the choral programme at the University in Cape Town. He was then offered a scholarship to study in Brisbane, Australia in the Young Artists Programme and was endorsed by the South African Minster for Arts & Culture. In 2004 Siphiwo was awarded a scholarship on the Postgraduate course to study at The Royal College of Music in London. He completed his studies at the RCM in 2007. Since Siphiwo has been in the UK he has been performing widely throughout Europe for both private and public engagements. It was 5 years ago, in 2005, that Siphiwo first sang for Nelson Mandela. At the time Siphiwo was on a postgraduate scholarship at the Royal College of Music, London. 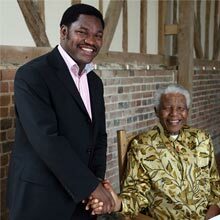 Siphiwo and Mr Mandela met at the home of Mr Niall Fitzgerald, Chairman of Reuters, just outside London. Mr Fitzgerald stated at the time, and several times since then, that Siphiwo was the greatest export of South Africa! The above photo of Siphiwo and Nelson Mandela was taken on that occasion. 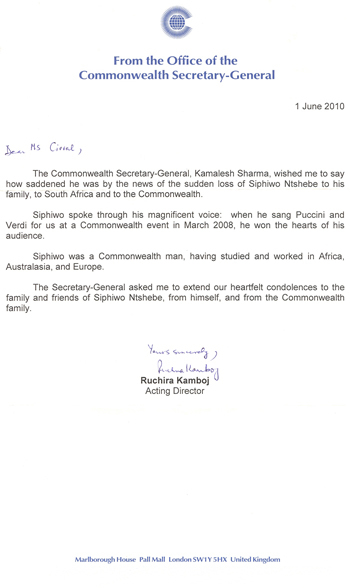 In 2007, Siphiwo was honoured to have a second opportunity to sing for Nelson Mandela. On that occasion it was in Monte Carlo at an event hosted by HSH Prince Albert of Monaco. 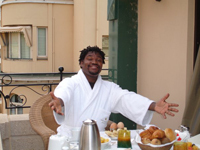 The photo above is of a very happy Siphiwo having a special breakfast in preparation for his performance for Madiba. Please allow me to thank you for your recent performance at our event in Monaco. We appreciate your efforts and we were very proud to show the world a young South African with so much talent that has, despite challenges of the past, chosen to work hard at a better future. You made us proud with your performance. We wish you well with your endeavours and hope to see you again in the not so distant future. In 2008, Siphiwo was extremely dissapointed to not have been invited to sing in Hyde Park, London, at Madiba's 90th Birthday Concert, however the recording of the Hope anthem ( released 1 June 2010) will now beome Siphiwo's greatest, and most lasting, tribute to his hero, Mr Nelson Mandela.